Embrace your inner culinary professional with this crisp, white chef jacket with double-breasted buttons. 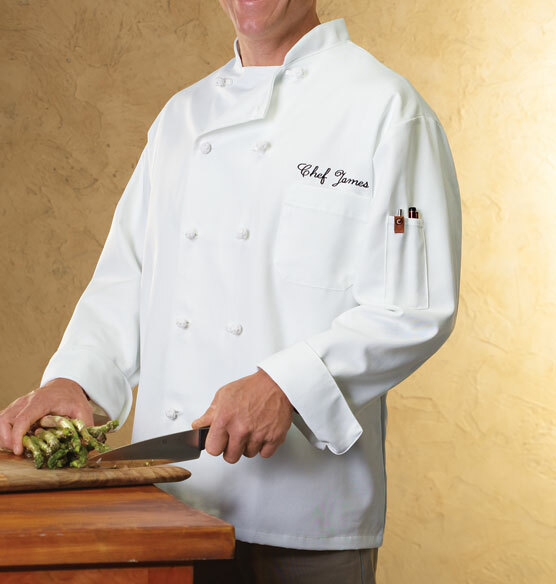 Just like the best embroidered chef coats, our coat features a stand-up collar and vented roll-up sleeves for comfort. The thermometer pocket is great for preparing meats. If you've always admired how professional kitchen cooks and chefs look in their white jackets emblazoned with their first name on the front, identifying them as a notable chef, here's your chance to own an embroidered chef coat for yourself, or give one to someone who has a passion for baking or cooking. The black embroidering is done in a natural scripted style and lettering is large enough to be easily seen by anyone in close proximity. This chef's coat perfect to wear at home or work and makes a wonderful gift for anyone with culinary aspirations. 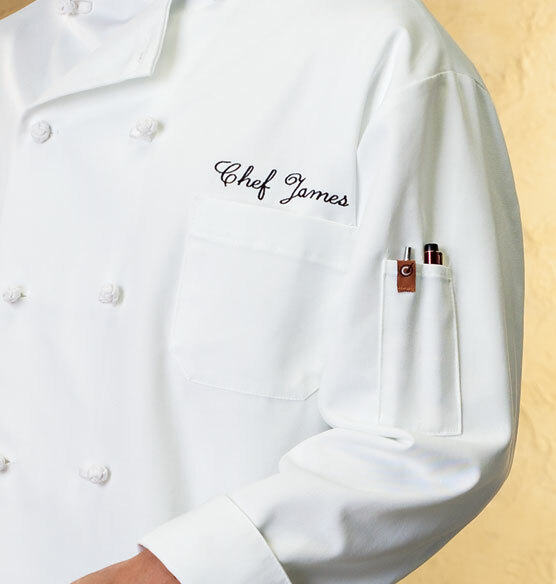 Double-breasted custom chef jacket features cloth knot buttons, stand-up collar, vented roll-up sleeves and thermometer pocket. Wear it embroidered with your name or gift to anyone with culinary aspirations. Thank you I enjoyed your product! My husband has just in the past 2 years taken up cooking and he is thrilled with something besides a ladies apron to wear. I ordered this for my son who is cooking in a new restaurant that only had t-shirts at the time. Since then, he has added the logo above the personalization and it looks awesome! He so loved receiving this with his name on it. It validates his dream! Great gift and quality, would buy again! Chef's jacket - great fun product. Comfortable to wear and personalized. Makes the perfect gift for that friend or family member that REALLY enjoys cooking! Because my friends will love it and they are awesome Chefs! Same reason as for the hat, but the coat was ordered in a 2XL - your above reference is in size Medium. I hope you don't send a medium, he won't be able to wear it!! It can be personalized for our 13th year old grandson! Great gift for my Nephew. I've ordered from here before. High-quality items! My son in law and daughter. For my son who likes to cook. I have ordered this product before and it is great. 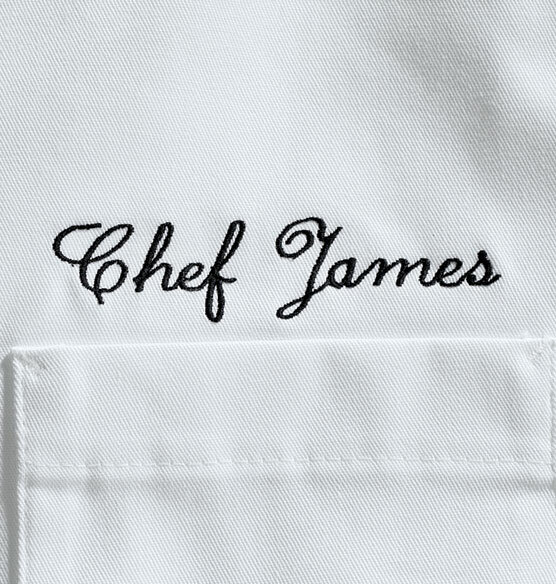 I needed a smart-looking personalized Chef's jacket, and this was the best price I could find. Does these chef coats run true to size? BEST ANSWER: Thank you for your question. You order by chest measurement: M (40"-42"), L (44"-46"), XL (48"-50"), 2XL (52"-54"; 2XL add $5). We hope this information will be of help to you. can I get two lines of embroidery? BEST ANSWER: Thank you for your question. We are not able to add two lines. We hope this information will be of help to you.